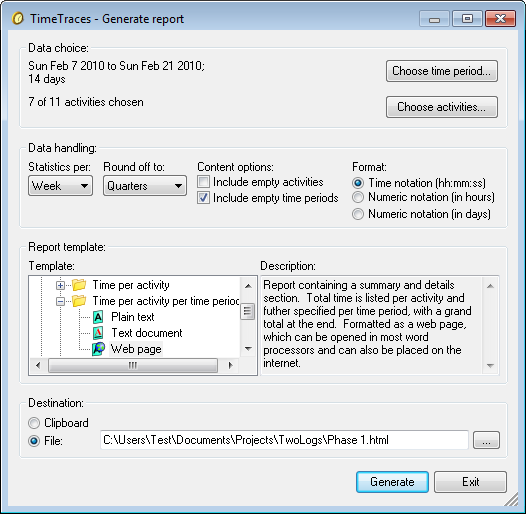 This window allows you to create a report of the time registration data. You can choose both the activities as well as the start- and end date/time of the time period for the report. Note that the end date/time is exclusive. The created report can either be put on the clipboard, or stored in a file on disk. See the Generate reports page for more information on reporting. The "Generate report" window can be accessed via the "Project \ Generate report..." menu item in the main window. The chosen time period and activities to use in the report. Choose the time period for the report via the "Choose time period" window. Note that the end date/time is exclusive. Choose the activities for the report via the "Choose activities" window. How to handle the time registration data in the report. Drop down list "Statistics per"
Generate cumulative statistics entries per hour, day, week, month, year or for the total report time period. Drop down list "Round off to"
Round off time durations per statistic entry to seconds, minutes, 6 minutes, quarters of an hour, half hours or hours. Check box "Include empty activities"
Whether to include activities in the report that have no time registered on them in the chosen reporting time period. Check box "Include empty time periods"
Whether to include time periods in the report that have no time registered on them in the selected reporting period. The notation in which to report the time statistics (time or numeric). The report template to use for formatting the report. See the Report look and layout page for an overview of the available options. The report template to use to format the report with. A description of the selected template. The destination to store the report in. See the help page Report destination for more information. When you choose "File", you can specify the file location. Use the button to browse to the location. When you omit an extension to the filename, the appropriate extension for the chosen report template will be used. Create the report using the chosen options. If you chose to report to file you will be asked if you want to open the created report as well. Show the "Generate report" window help page.